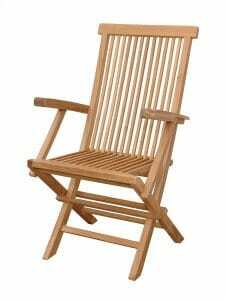 Wooden folding chairs speak of elegance and comfort whether used on the beach, in the backyard or on the patio. Wood is a versatile material that blends well with just about any type of outdoor decor. So many types of backyard events can be made more comfortable with a few chairs. For casual use, having just a few chairs for yourself and the family usually works just fine. However, things like birthdays and pool parties require extra seats for visitors. To keep that many seats on hand could take up a phenomenal about of room. Folding wooden chairs solve this problem by taking on a compact, easy to store shape when folded up. 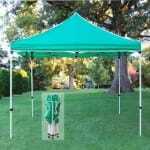 This allows many units to fit inside of a small space such as a garage or shed, and taken out only when needed. Wooden folding chairs are far more appealing than other chairs made from plastic or metal. The tone and color of the wood can be altered with different stains. Some people prefer a lightly colored, untreated piece while others enjoy a deep red mahogany. The grain in the wood gives each piece character and poise. Wood chairs may not be portable enough for taking to the beach or local park, but they make up for it in strength. Commonly constructed with "mortise and tenon" or wooden dowel joints, a quality wooden folding chair can last many years if cared for properly. Some manufacturers like to use wooden joints in the folding mechanism, while others prefer galvanized metal hardware. Regular cleaning is important for long term wood health, especially when exposed to excessive moisture and dirt. A gentle wipe-down with a damp cloth works well. If chipping of the sealer or fading is present, the wood will have to be sanded down and re-sealed. This provides the perfect opportunity to change the color of the chair using a new stain. Wood chairs come in many forms, each of which have a different use around the yard. Standard chairs sit at an average height, making them ideal for use at outdoor tables. Tall, high-back chairs are commonly used with outdoor bistro sets. Folding beach and chairs position users much lower to the ground, allowing their feet to lie on the ground. Lounge chairs are long, low-standing chairs that allow users to lie back flat. Adjustable back and leg sections allow for several different sitting positions. All of these folding chairs can be made from wood. While wood is exceptionally beautiful, sitting for long period of time on it can be uncomfortable. Curved back and seat sections are more ergonomic, but should be coupled with a seat pad for maximum comfort. Seat pads for wooden chairs are removable and can be taken indoors during a rain. Pads can be placed on both the seat and back portions by tying them on. Selecting a set of chair pads is fun in itself because you can choose from a wide selection of colors and patterns. For maximum longevity, chair covers should be used on all of your pieces. Chair covers are made from fabric or plastic and slide easily over your chairs. They keep moisture and dirt out so they are always clean and fresh. 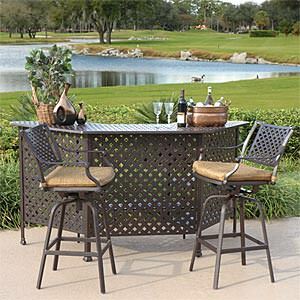 For additional resources on outdoor furniture products, check out Backyard Design Ideas. 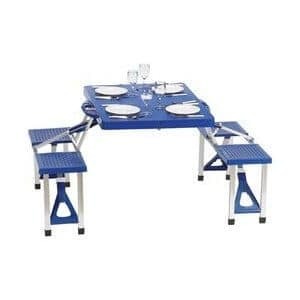 What is a Portable Picnic Table?